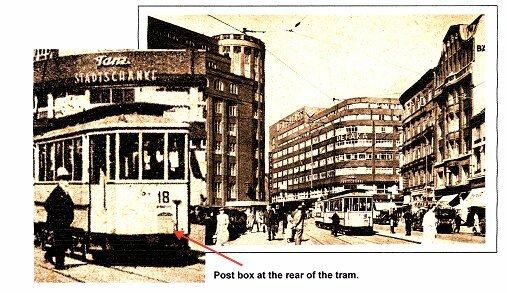 The article describes the story of the tram post in Hamburg (1922 – 1943) for ordinary letters. In this period people were permitted to post their letters into post boxes on the tram cars. In Hamburg the „Reichspost“ (imperial post) used the extensive tram network for postal service. The tram network in Hamburg was in a star configuration at the central railway station. The purpose of the transportation was a fast supply lead of the letters in the post internal circuit. Letterboxes on street corners or in post-office buildings were emptied regularly one to three times per day; tram mailboxes nearly every hour. Every box reaching the central points was emptied. The transmission time for letters could be shortened to around one to two days. A contract was entered between the “Reichspost” and the “HHA” (“Hamburger Hochbahn Aktiengesellschaft” – Hamburg elevated railway corporation) concerning the postal service and was effective from the 1. September 1920. Between the 1. September 1920 and 31. December 1921 only express letters or telegrams were allowed to be sent. The “HHA” fastened post boxes to the tram cars. Emptying places were located near Hamburg central station. 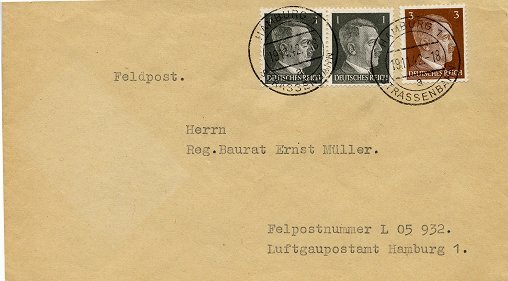 Because of the success of this postal service ordinary letters were also allowed to be posted; these however required special charges of 75 Pfennig; beginning 1. January 1922. For telegrams and express letters no special fee was to be paid. The mail house or “Postpavillon” (also known as the “NIVEA-Pavillon” due to its neon sign from the Baiersdorf company) was located in “Steintorwall” next to central station. It was the drop-off point for all the letters from the tram service. 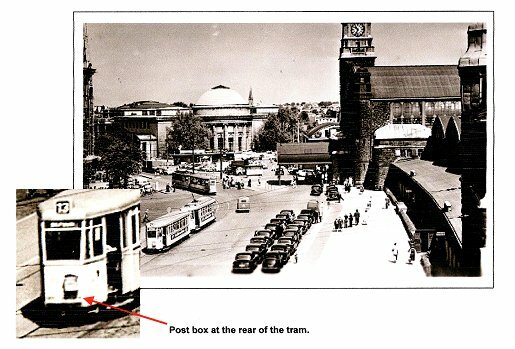 The tram post mail boxes were attached on the trams which crossed the streets “Steintorbrücke”, “Mönckebergstraße” and “Georgsplatz”. The mail boxes were emptied from 7 a.m. to 11 p.m.. At other times the letter box flap was locked down. Picture 2: A souvenir of the stamp exhibition 2000 from the “Harburg Briefmarkensammler Verein von 1920 e.V.” (“Harburger – stamp collector organization”) an illustration on a postcard shows the emptying of a tram mail box. Picture 3: Cut out of a map of Hamburg from the year 1936. At the every stop points “Steintorbrücke”, “Mönckebergstraße” and “Georgsplatz” the mail was picked up by a “Dauerposten” (static postman). He then placed the mail in a leather bag which was to be delivered to the “Postpavillon” by a “Läufer” (runner) every 10 minutes. 1.2 Main Post Office 1 "Hühnerposten"
Picture 4: The coloured postcard shows the mail railway sidings and the building of the Main Post Office 1 "Hühnerposten" in the year 1905. This post building is opposite the central station. 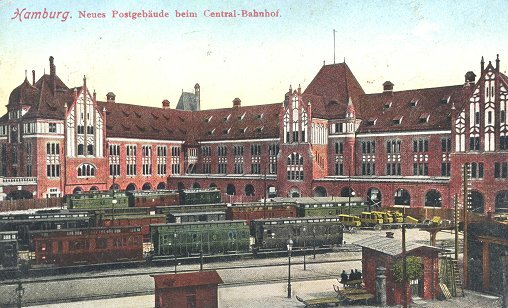 The “Postpavillon” was under supervision of Hamburg Main Post Office 1 (“Hühnerposten”). This Main Post Office 1 held a special position among the post organisation of the German Reich because the public tram post service was only established in Hamburg. The “Postpavillon” and the Main Post Office 1 were interconnected by a pneumatic mail system. A fast exchange of the mail shipments was ensured. From the Main Post Office 1 the consignment could travel inter-city-letter directly by railway. The building has direct railway sidings. ring segment bridge with information: date, time domain. „ZUG“ (train) in upper ring segment. Ring segment bridge with information: date, time in steps of ten minutes. Typically the cancel is used for express letter incoming by railways. On route passing cancellation the ring segment bridge shows in addition the railway train number. By using for tram post, the train number are missing. 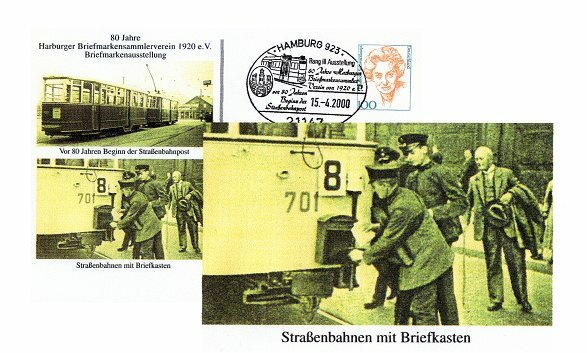 Because of the special charges the shipments required a special rubber stamp from the tram post; this had to display the message “Aus dem Straßenbahnbriefkasten” (“From the tram post box”). Insufficient payments for postage received an excess penalty. 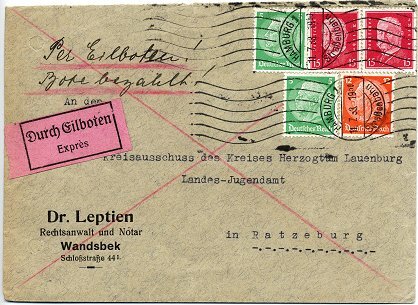 In order to avoid misunderstandings with the public the signification of “express letter” was gradually replaced from the stamp “EILBRIEF” (express letter) to “Straßenbahnpost” (tram post). Therefore the rubber stamp “Aus dem Straßenbahnbriefkasten” (“From the tram post box”) had become redundant. In times of rush hour the trams run with motor coach and trailer vehicle. The mail boxes were always attached at the end of a tram. If the motor coach ran alone at weekends, then this carried the mail box. Picture 5: The postcard shows the tram line 18 in the square “Gänsemarkt”. The line 18 had the following route 1939: Business station “Dorotheenstraße”, “Winterhuder Marktplatz”, “Rothenbaumchaussee”, “Rathausmarkt” (city hall market), “Hauptbahnhof” (central station), “Hofweg”. More than 20 of 42 tram lines were involved in the network of the postal service. To beginning with the fleet of tram cars consisted of 2-axle based steel rack and wooden car bodies. In 1927 a larger 4-axle vehicles came into use and from 1935 a newer version in completely steel. The political situation enforced the introduction of these special charges. With the start of postal service for ordinary letters special charges of 75 Pfennigs per letter were levied. The special charges were changed 18 times before 26. November 1923. They rose in the time of hyperinflation to 5 billion marks on the 1. December 1923. All letters out of the tram post boxes were given a postmark like this “aus dem Straßenbahnbriefkasten” (out of the tram post box) registering the special charges (see 1.3 Tram post cancel). Then it was checked whether additional fee was covered by the postage stamps. If the payment was not enough an excess postage was charged. The excess postage was written by hand with blue crayon on the letter. The receiver of the letter had to pay the excess postage. Incorrectly paid letters were charged double the difference to the regular price until 27. February 1923 and from the 1. March 1923 they were charged 1 ½ times the difference. Posted to Leipzig on 7. November 1922 with a regular total of 7,00 Marks (6,00 Marks paying the inter-city rate - “Fernverkehr” - for up to 20 grams plus 1,00 Mark special charges for the tram post). Paying 6,00 Marks. The letter is with 1,00 Mark incorrectly paid. Surcharge: 200 Pfennigs. The excess postage signed with a blue crayon „200“ for 200 Pfennigs. Surcharge regulation double the difference to the regular price. 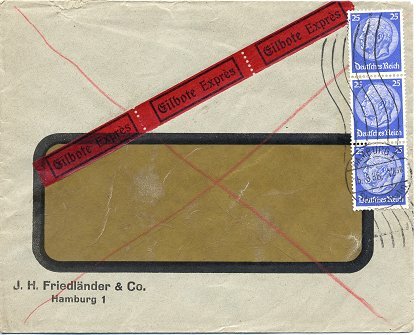 Trampost postmarks: ring segment standard cancel → 27 mm “EILBRIEFE” (Cancel 1) and L 2 „Aus dem / Straßenbahn=Briefkasten“ (rubber supplement cancel A). Posted to Magdeburg on 9. January 1923 with a regular total of 39,00 Marks (35,00 Marks paying the inter-city rate - “Fernverkehr” - for up to 20 grams plus 4,00 Marks special charges for the tram post). Paying 37,00 Marks. The letter is with 2,00 Marks incorrectly paid. Permitted delivery without at a surcharge regulation. Trampost postmarks: ring segment standard cancel → 27 mm “EILBRIEFE” (Cancel 1); L 2 „Aus dem / Straßenbahn=Briefkasten“ (rubber supplement cancel A). Posted to Solingen on 27. August 1923 with a regular total 21,000 Marks (20,000 Marks paying the inter-city rate – „Fernverkehr“ – for up to 20 grams plus 1,000 Marks special charges for the tram post). Paying 20,000 Marks. The letter is 1.000,00 Mark incorrectly paid. Surcharge : 1.500,00 Marks. The excess postage signed with a blue crayon „1500“ for 1,500 Marks. Surcharge regulation 1 ½ times the difference to the regular price. Trampost postmark: ring segment standard cancel → 27 mm “EILBRIEFE” (Cancel 1); L 2 „Aus dem / Straßenbahn=Briefkasten“ (rubber supplement cancel A). Express letter posted to Berlin on 6. November 1923 with a regular total of 3,000 million Marks (1,000 million Marks paying the inter-city rate – „Fernverkehr“ – for up to 20 grams plus 2,000 million Marks special charges for the express surcharge). The German Reich undertake a currency reform. With the introduction of the “Rentenmark” on 1. December 1923 a special charge of 5 Pfennigs was fixed on all forms of tram post. Exceptions were express letters. Airmail was a non-uniform official use. 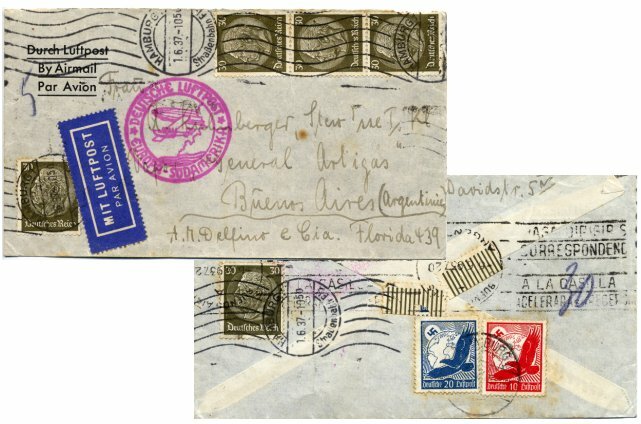 Airmail was usually allowed without special charges like express letters. In this postage class the price of tram postage was included. In the case of airmail it was common that many items carried no special charges. Postcard posted to Halle/Saale on 28. 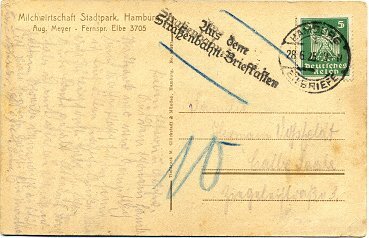 June 1925 with a regular total of 10 Pfennigs (5 Pfennigs paying the postcard rate plus 5 Pfennigs special charges for the tram post rate). The payment is 5 Pfennigs. The postcard is 5 Pfennigs incorrectly paid. Surcharge regulation: 1 ½ times the difference to the regular price must be at least as high as 10 Pfennigs (Surcharge rate up to December 1923). Surcharge: 10 Pfennigs. The excess postage signed with blue crayon „10“ for 10 Pfennigs. Trampost postmark: ring segment standard cancel → 27 mm “EILBRIEFE” (Cancel 1); L 2 „Aus dem / Straßenbahn=Briefkasten“ (rubber supplement cancel B). 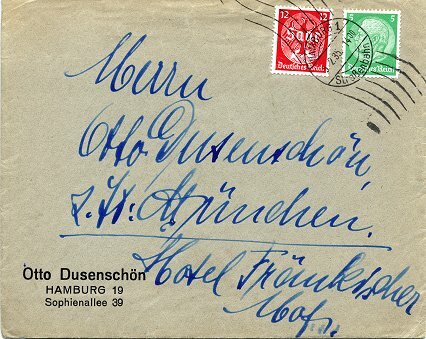 Postcard posted to Wiesdorf on 23. March 1930 with a regular total of 13 Pfennigs (8 Pfennigs paying the postcard rate plus 5 Pfennigs special charges for the tram post rate). The payment is 8 Pfennigs. The postcard is 5 Pfennigs incorrectly paid. Surcharge regulation: 1 ½ times the difference to the regular price must be at least as high as 10 Pfennigs (Surcharge rate up to December 1923). Surcharge: 10 Pfennigs. The excess postage signed with blue crayon „10“ for 10 Pfennigs. Trampost postmark: handroller stamp with ring segment standard cancel → 25 mm “EILBRIEFE” (Cancel 3); L 2 „Aus dem / Straßenbahnbriefkasten“ (rubber supplement cancel C). Postcard posted to Hanover on 23. March 1936 with a regular total of 11 Pfennigs (6 Pfennigs paying the postcard rate plus 5 Pfennigs special charges for the tram post rate). The payment is 6 Pfennigs. The postcard is 5 Pfennigs incorrectly paid. Surcharge regulation: 1 ½ times the difference to the regular price must be at least as high as a full Pfennig (Surcharge rate up to March 1931). Surcharge: 8 Pfennigs. The excess postage signed with blue crayon „8“ for 8 Pfennigs. Trampost postmark: handroller stamp with ring segment standard cancel → 25 mm “Straßenbahn” (Cancel 4); L 2 „Aus dem / Straßenbahnbriefkasten“ (rubber supplement cancel C); supplement cancel: “Nachgebühr” (surcharge). Postcard posted to Gdansk (national mail) on 23. May 1935 with a regular total of 11 Pfennigs (6 Pfennigs paying the postcard rate plus 5 Pfennigs special charges for the tram post rate). The payment is 11 Pfennigs. Note: German stamps featuring President Paul von Hindenburg. When von Hindenburg died they printed a black border on the stamps. Postcard posted to Bremen on 16. November 1935 with a regular total of 11 Pfennigs (6 Pfennigs paying the postcard rate plus 5 Pfennigs special charges for the tram post rate). The payment is 12 Pfennigs. 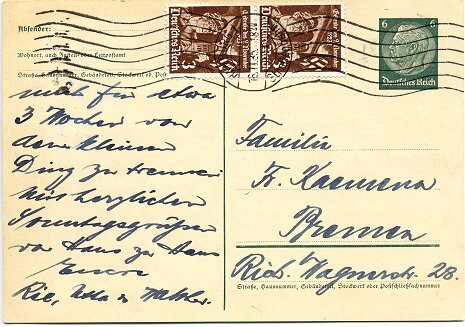 The postcard is 1 Pfennig overpaid. 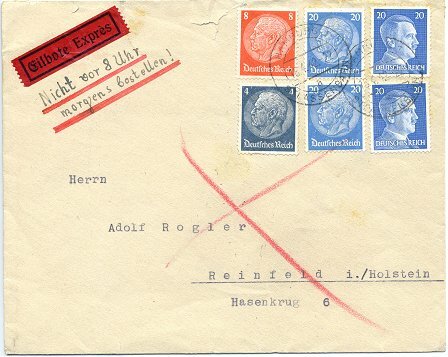 Note: Stamps as instruments of Nazi propaganda. City-Letter (“Ortsbrief”) posted on 8. August 1937 with a regular total of 13 Pfennigs (8 Pfennigs paying the city-letter rate plus 5 Pfennigs special charges for the tram post rate). The payment is 13 Pfennigs. Inter-City-Letter (“Fernbrief”) posted to Munich on 5. March 1935 with a regular total of 17 Pfennigs (12 Pfennigs paying the inter-city-letter rate plus 5 Pfennigs special charges for the tram post rate). The payment is 17 Pfennigs. Inter-City-Letter („Fernbrief“) posted to Mittenwald on 20. February 1939 with a regular total of 17 Pfennigs (12 Pfennigs paying the inter-city-letter rate plus 5 Pfennigs special charges for the tram post rate). „Handrollenstempel“ (handroller postmark) – tram post cancel number 4 - with day-long readout and „Straßenbahn“ (tram) in segment. In the “Postpavillon” unstamped postage stamps were devalued with the hand stamp “1 aq” in segment – tram post cancel number 2 - in the stamp room of the Main Post Office 1 (“Hühnerposten”). City delivery area (“Ortszustellung”) rate 40 Pfennigs; overland delivery area (“Landbestellbezirk”) rate 80 Pfennigs. In these postage class the price of tram postage was included. Express letter posted to Ratzeburg on 11. July 1933 with a regular total of 52 Pfennigs (12 Pfennigs paying the inter-city-letter rate plus 40 Pfennigs special charges for city delivery area - “Ortszustellung” -). Note: hand made red crayon cross for post internal information: this is an Express letter. Express label. Express letter posted to Reinfeld on 18. April 1942 with a regular total of 92 Pfennigs (12 Pfennigs paying the inter-city-letter rate plus 80 Pfennigs special charges for overland delivery area (“Landbestellbezirk”) rate. 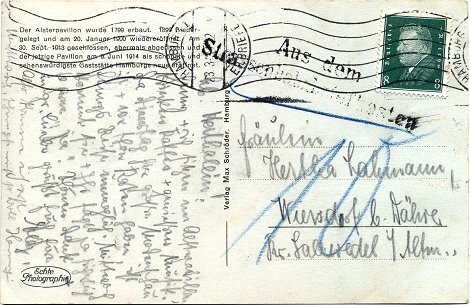 Foreign-Postcard (“Auslandspostkarte”) posted to London on 24. 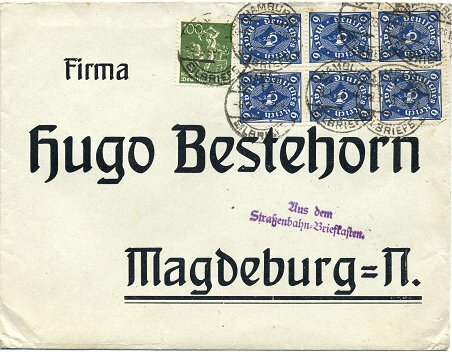 June 1930 with a regular total of 20 Pfennigs (15 Pfennigs paying the postcard rate – European countries - plus 5 Pfennigs special charges for the tram post rate). Trampost postmark: handroller stamp with ring segment standard cancel → 25 mm “EILBRIEFE” (Cancel 3). Foreign-Letter (“Auslandsbrief”) posted to Copenhagen on 22. August 1931 with a regular total of 30 Pfennigs (25 Pfennigs paying the letter rate – European countries - plus 5 Pfennigs special charges for the tram post rate). 3.4.1 Express letters to foreign countries. The express delivery rate to foreign countries is 50 Pfennigs. In this postage class the price of tram postage was included. 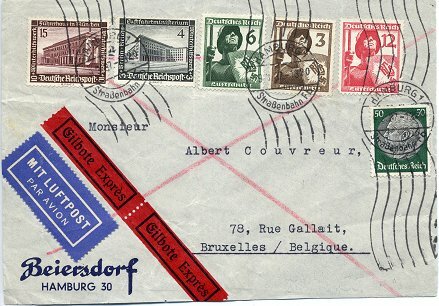 Foreign express letter (“Express Auslandsbrief”) posted to Brussels in Belgium on 9. 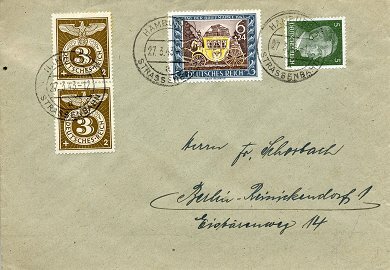 March 1937 with a regular total of 90 Pfennigs (40 Pfennigs paying the letter rate for up to 40 grams – European countries - plus 50 Pfennig special charges for the express post rate to foreign countries). Foreign express postcard (“Express Auslandspostkarte”) posted to Kildekrog by Hornbaek in Denmark on 14. 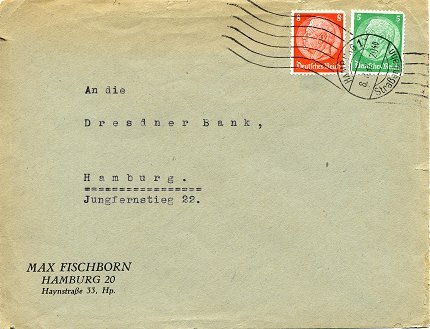 August 1933 with a regular total of 65 Pfennigs (15 Pfennigs paying the postcard rate – European countries - plus 50 Pfennigs special charges for the express post rate to foreign countries). The payment is 55 Pfennigs. The postcard is 10 Pfennigs incorrectly paid. Surcharge regulation. 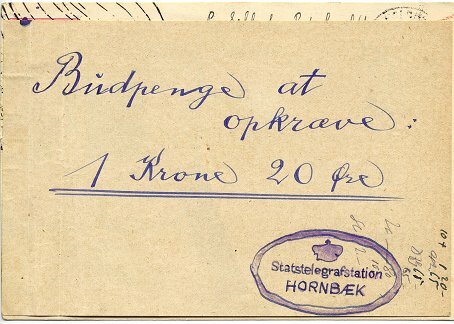 The Denmark Post collect a debt about 1 Krone 20 Øre („Statstelegrafenstation HORNBÆK“ sucharge paper on the backside of the postcard). Foreign express letter (“Eilbrief - Auslandsbrief”) posted to Helsingborg in Sweden on 15. 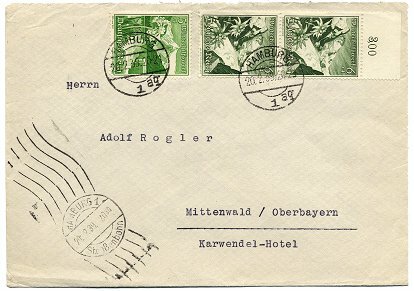 August 1938 with a regular total of 75 Pfennigs (25 Pfennigs paying the letter rate for up to 20 grams – European countries - plus 50 Pfennigs special charges for the express post rate to foreign countries). Note: hand made red crayon cross for post internal information: this is an Express letter. Express labels. Effective from 30. 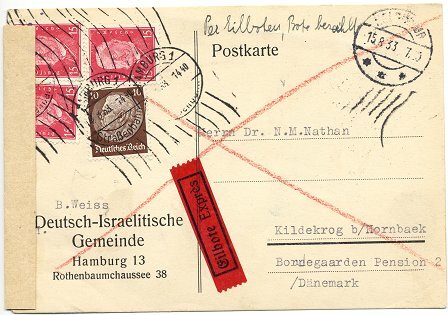 November 1940 geographical limits of the inland mail charges were expanded to the occupied countries. Foreign express letter (“Eilbrief - Auslandsbrief”) posted to Prague in Bohemia and Movaria on 28. 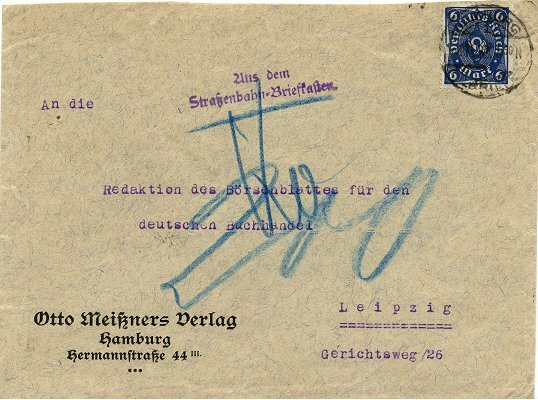 May 1942 with a regular total of 47 Pfennigs (12 Pfennigs paying the letter rate for up to 20 grams – inland mail charges - plus 40 Pfennigs special charges for the express post rate and 5 Pfennigs airmail charges). Note: hand made red crayon cross for post internal information: this is an Express letter. 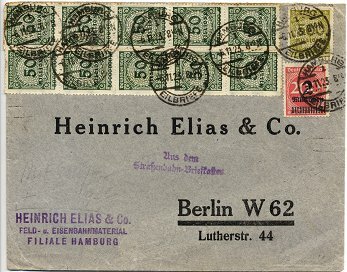 Express and airmail label. Examples of the difference with and without special charge of 5 Pfennigs for tram post. 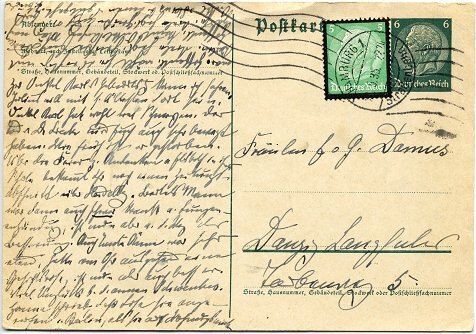 Foreign letter (“Auslandsbrief”) posted to Sandaun / Sweden on 25. 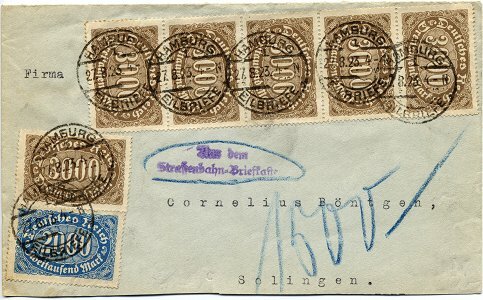 May 1935 with a regular total of 70 Pfennigs (40 Pfennigs paying the letter rate for up to 40 grams – European countries - plus 30 Pfennigs special charges for the air mail rate). - The item carried no special charges for tram post. 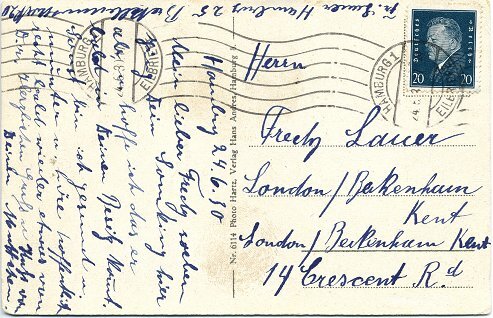 Foreign letter (“Auslandsbrief”) posted to London on 11. 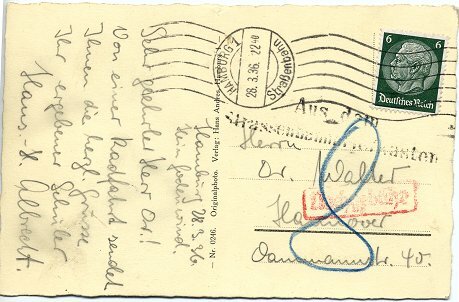 May 1937 with a regular total of 105 Pfennigs (55 Pfennigs paying the letter rate for up to 60 grams – European countries - plus 40 Pfennigs special charges for the air mail rate). The item carried no special charges for tram post. 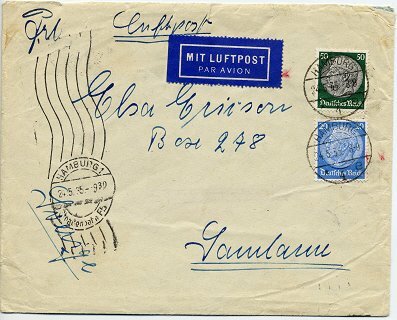 Foreign letter (“Auslandsbrief”) posted to Buenos Aires / Argentina on 1. May 1937 with a regular total of 175 Pfennigs (25 Pfennigs paying the letter rate for foreign airmail plus 150 Pfennig special charges for the air mail rate – Argentina rate up to 5 grams, plus 5 Pfennigs tram post rate). The payment is 180 Pfennig. The item carried the special charges for tram post. Note: The weight is signed with black crayon “5” for 5 grams. 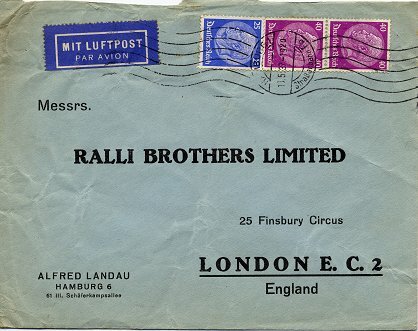 Airmail label. 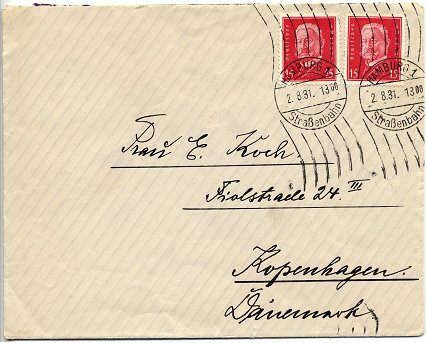 A red conformation postmark „DEUTSCHE LUFTPOST * EUROPA – SÜDAMERIKA *“ (German Airmail – Europe - South America. (30 Pfennigs is stuck on back side). 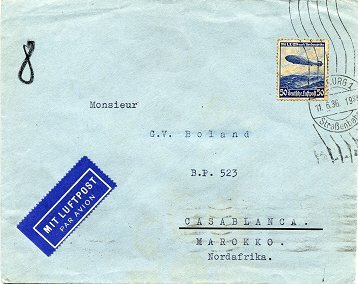 Foreign letter (“Auslandsbrief”) posted to Casablanca / Morocco on 11. June 1936 with a regular total of 50 Pfennigs (25 Pfennig paying the letter rate for foreign airmail plus 25 Pfennig special charges for the air mail rate – Morocco rate up to 10 grams). The payment is 50 Pfennigs. The weight is signed with black crayon “8” for 8 grams. 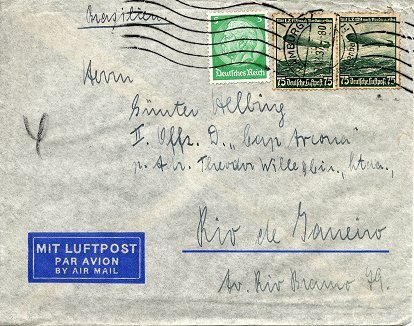 Foreign letter (“Auslandsbrief”) posted to Rio de Janeiro / Brasil on 11. December 1937 with a regular total of 155 Pfennigs (25 Pfennigs paying the letter rate for foreign airmail plus 125 Pfennigs special charges for the air mail rate – rate up to 5 grams, plus 5 Pfennigs tram post rate). The item carried the special charges for tram post. The weight is signed with black crayon “4” for 4 grams. The payment is 155 Pfennigs. Note: Airmail envelope with printed airmail label. 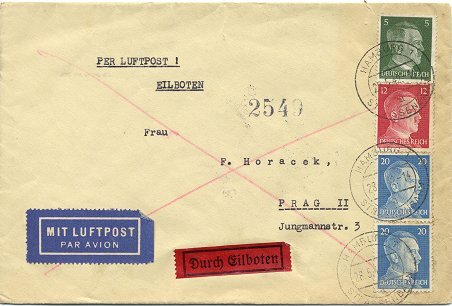 Fieldpost letter which took the special trampost service had to carry the regular charges of 5 Pfennigs. Army postal service city letter posted on 19. November 1942 with a regular total of 5 Pfennigs (army postal exempt from postage plus 5 Pfennigs special charges for the tram post rate). Paying 5 Pfennigs. This is probably a counterfeited letter. The tram post cancel (cancel no. 6) seems to have been used for the counterfeited letters in the confusion of the war. Particularly pieces of evidence to the Reg. Baurat (government building officer) Ernst Müller are in danger of being counterfeited or of cancellation to order. The war came to Germany. The whole infrastructure destroyed by air raid in July and August 1943 in Hamburg (Operation Gomorra). After the bomb attacks the tram division of postal service was terminated (last date 24. July 1943). Inter-City-Letter (“Fernbrief”) posted to Berlin on 27. March 1943 with a regular total of 17 Pfennigs (12 Pfennigs paying the inter-city-letter rate plus 5 Pfennigs special charges for the tram post rate). The payment is 17 Pfennigs. Trampost postmark: segment standard cancel → 28 mm “STRASSENBAHN” (Cancel 6). For a short period between the 1. August 1949 and 31. March 1958 the tram post was reintroduced. In this period no special fee was charged. With the increase of telephone and teleprinter usage this public network service was no longer necessary. 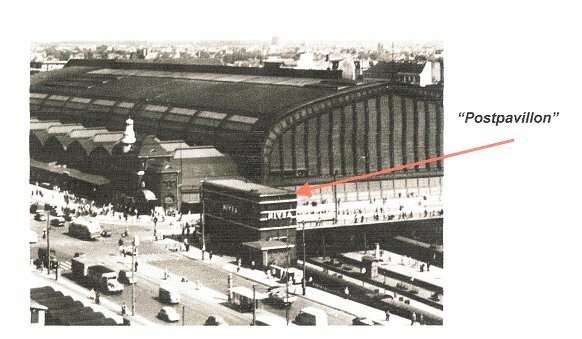 Picture 5: The postcard shows the street “Steintorwall” of front of the Hamburg central station in the year 1956. On the trams of the line 12 and line 13 post boxes are fixed at the rear of the tram. My special gratitude is for Harald Krieg and Thomas Kahlbom (authors of numerous publications over tram post and other posthistoric topics) who have repeatedly helped me with the draft of my own collection and for Steve Riley who has patiently corrected my English mistakes from the manuscript. /5/ All pictures, cancels and letters are examples of my collection.